Home /asphalt, Electric, On Road, Xray T2 008/Asphalt! Yesterday was the first on road asphalt race of the season here in Georgia. After a failed attempt (or lack thereof) last season to put together a make-shift parking lot track, yesterday was a huge success with about a dozen cars each class, 17.5 and nitro tc. It was great to change up a little bit and get outside. I always look forward to wither asphalt when it’s Winter or carpet when it’s Fall. The track worked well for both nitro and electric in terms of size. The plan is to extend it for next race to let the nitro cars breath a bit more. Traction was mediocre but I think the more we race, the better the conditions will get. It will be interesting to see how the heat affects tire wear and consistency. I brought my now T2 008 to the track without any prior asphalt knowledge with the carpet setup from my T2R. I struggled to get more steering out of the car as it pushed badly throughout the entire corner. I thought I would ‘unhook’ the rear by standing the rear shocks up more. This helped but the car was no where near perfect. Due to a bad crash and getting caught without a fully charged battery, I only completed one qualifying round which unfortunately landed me in the B main. I was doing alright during the main but I was spun out by a couple other drivers which ruined my chances for the win. First place guy drove a great race so kudos to him! In all it was a good day. Parking lot tracks have the one advantage of being able to practice nearly anywhere. Today I worked with the car after work and messed with roll centers. I found that rather than messing the rear to get the car to unhook, I made the rear links more parallel and the front more angled. Even on the super pollinated parking lot in front of my apartment, the car had more steering and especially more initial bite. It’s not as much steering as I’d really like but it’s a start. In all, it was a great day, especially for the hobby. It was wonderful to see all of the spectators taking pictures, asking questions, and hearing kids beg their parents to keep watching the racing action. This is what American R/C racing needs! 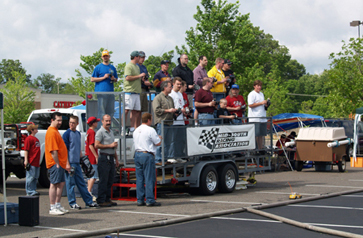 See the picture below – this isn’t us but it’s similar to the trailer-style driver’s stand in the parking lot.